The American Electric Power Co. coal-fired John E. Amos Power Plant in Winfield, W.Va. The Trump administration wants to save the coal industry, but it may have to disappoint the electric power and oil and gas industries to try to do it. Electric utilities, oil and gas companies, and coal companies put forth a largely united front urging the Environmental Protection Agency to replace Obama-era carbon dioxide limits on existing power plants with a narrower alternative. But fissures among the industry sectors are emerging now that the EPA is working to complete its replacement rule. The Trump administration will have to choose between the diverging interests of the coal sector, which is seeking an economic boost, and the rest of the energy industry, which is moving toward low-carbon power. At the crux of the split is whether utilities should be allowed to use emissions trading to meet the new limits. 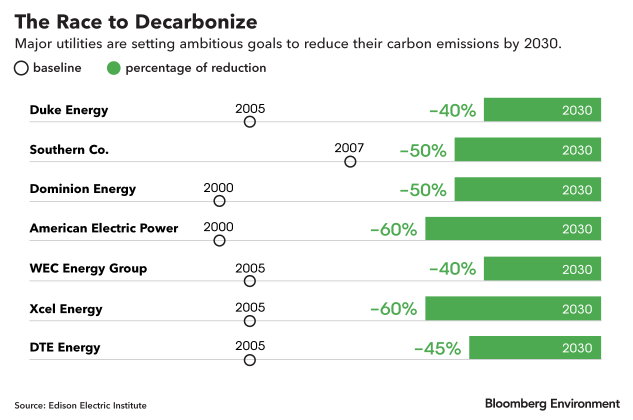 Under emissions trading, power plants that produce fewer emissions than allowed can sell credits to those that emit more, to help bring them into compliance. Utilities and oil and gas companies say emphatically in recent comments that the EPA shouldn’t close off any compliance options. Shell Oil Co. even says in comments it would be “arbitrary and capricious” to prohibit trading when the air law allows it. Coal companies, though, are opposing trading as inconsistent with the narrow approach they say the EPA must take under the air law. Whatever the EPA chooses could complicate efforts to cut greenhouse gases from the power sector, the second-largest emitting U.S. sector after transportation. Excluding trading could disrupt utilities’ plans on the margins, directing dollars to existing coal units instead of other energy sources. Conversely, allowing trading could thwart any incentive to spend money improving coal plant efficiency, allowing them to run longer. Environmentalists say a rule with trading won’t accomplish much because the EPA’s proposed standard is already too weak to achieve meaningful reductions. And either approach is likely to face legal challenge, denying utilities a certain regulatory landscape in which to make investments. Power companies argue barring trading from the EPA’s proposal—the Affordable Clean Energy (ACE) rule—could slow their transition to low-carbon energy. “Failure to provide such compliance flexibility to states has the potential to undermine the on-going clean energy transition by increasing the cost of electricity for customers and increasing economic burdens on the existing coal-based fleet,” the Edison Electric Institute, which represents major utilities including American Electric Power, Southern Co., and Duke Energy, wrote in comments. The EPA’s August proposal would require utilities to seek efficiency upgrades at individual coal-fired units. The Obama-era Clean Power Plan had looked at the whole electricity grid and included measures such as switching to natural gas and renewable energy. But while the Obama EPA explicitly allowed trading, the agency’s August proposal questions whether it can legally include it. The Trump EPA is proposing it is unlawful for the agency to consider anything beyond what an individual power plant can achieve through efficiency improvements. Agency officials aren’t sure whether that interpretation squares with an emissions trading system. Coal companies such as Peabody Energy, as well as groups such as the National Mining Association and the American Coalition for Clean Coal Electricity, say it doesn’t. Emissions trading would undermine the rule’s intent, which is to improve coal plants’ efficiency, Michelle Bloodworth, president and chief executive officer of the coal coalition, told Bloomberg Environment. “The rule wasn’t intended to cause the retirement of coal plants,” she said. The EPA estimates its proposal would avoid the closure of some 5,000 megawatts of coal-fired power, compared to the Clean Power Plan, Bloodworth said. The power sector, though, is in a much different place than even a few years ago when the Clean Power Plan was unveiled in 2015. “Increasingly you’re seeing utilities that were never considered to be at the forefront of renewable energy development now making multi-gigawatt deals,” John Larsen, director of the Rhodium Group’s U.S. power sector and energy systems research, told Bloomberg Environment. He listed Duke Energy, American Electric Power, Southern Co., and Dominion Energy as examples. In most parts of the country, solar and wind are the cheapest new source of power and in some places are even cheaper than existing coal power, Larsen added. Utilities are telling the EPA that a rule barring use of trading for compliance would ultimately cost them more money. Dominion, for example, said in comments that excluding trading was a rigid approach that could create unintended consequences, such as increasing cost to consumers. A narrow rule without opportunity to trade could superimpose on utilities “a command-and-control regulatory approach that doesn’t square with how they’re actually doing generation planning,” Kyle Danish, a partner at Van Ness Feldman LLP, told Bloomberg Environment. Some utilities in their comments also suggest limitations on trading could ultimately hurt existing coal-fired power. “Without this flexibility, [power plant] owners that face challenges in complying with a CO2 performance standard may choose to shut down an otherwise viable coal plant,” DTE Energy wrote in comments. Coal groups, though, say the EPA already built flexibility into its rule without trading. For example, the agency allows for greater consideration of a plant’s remaining useful life when determining what standard that plant should meet, Bloodworth said. If a plant is nearing retirement, state regulators can set less stringent or no requirements for it under the proposal. “The rule is intended to be flexible enough where a utility wouldn’t have to have broad emissions trading that would force the closure of the plant,” she said. Observers say the Trump EPA may choose to favor coal over the interests of the utility and oil and gas sectors. “The administration correctly perceives that the coal industry is suffering from real and significant economic disadvantage,” Joseph Goffman, former senior counsel in the EPA’s air office during the Obama administration, told Bloomberg Environment. “In a way, what ACE represents is the proposition that the coal industry needs as much help as it can get, and that even if that affects competition ostensibly with the oil and gas sector, the oil and gas sector is doing well enough that it can sustain that competition,” added Goffman, now executive director at Harvard University’s Environmental and Energy Law Program. But if the EPA declines to include trading, it could put utilities in a tough spot, requiring them to direct money to existing coal units to improve their efficiency, or heat rates, rather than investing in more cost-effective and cleaner resources. The question will be whether that spot is tough enough for them to push back.